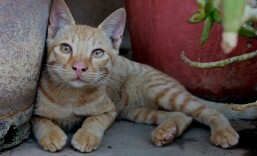 On an October weekend in 2011 I made a fleeting trip to Mysore. It was a Saturday and the beginning of Dussehra. I was travel hungry and thought Mysore was the best place to visit at that time of the year. The journey was quite special to me. It was the first time I was travelling on a fun trip alone. Most important on my travel agenda was a trip to the Chamarajendra Zoological Gardens, one of the best zoos in India. No sooner had I stepped into the vast expanses of the zoo, I went on a clicking spree. Back then, I did not have a DSLR and a point-and-shoot analog was my companion. I couldn’t get very good shots. Some of the pictures were terrible. My favourite critters of the day were Polo, the oh-so-endearing and gentle gorilla and a double-horned rhinoceros. When Polo had come out of his enclosure I was behind him. 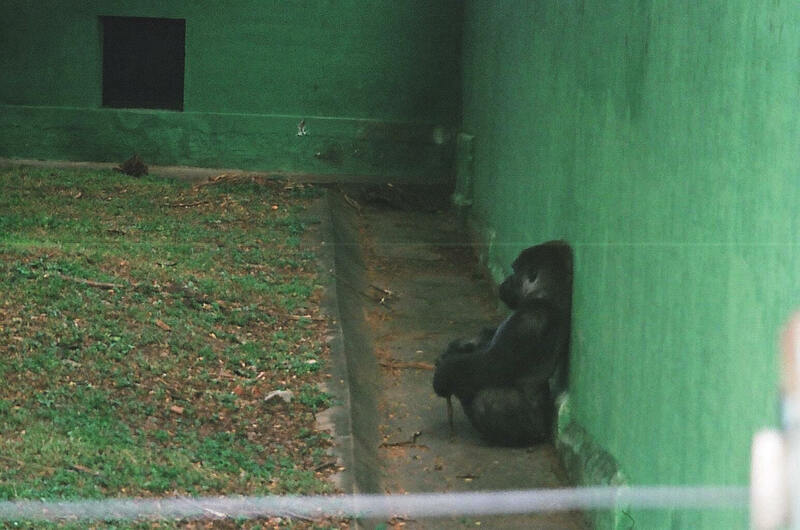 From a considerable distance I could notice the typical gorilla pose and the loud signage at the enclosure which said that he was Asia’s lone gorilla. I raced towards the gorilla enclosure to have a front view of this majestic creature. But oh dear! I was a wee bit late. Polo had settled against a wall with a twig in hand as if in meditation. I waited for as long as I could for Polo to get up and come closer to the visitors so that I could have a good look at him. He didn’t budge and my wait proved futile. I had to leave disappointed. The only picture I took of Polo on a trip to Mysore Zoo. I have always been in awe of Amrita Sher-Gil ever since I happened to see some of her paintings in a leading Indian glossy. Those were the pre-Internet days when we had to rely on the library, books and media to update our knowledge. Apart from some tidbits I couldn’t get to know much about her. Ever since it started in 2009, the National Gallery of Modern Art has been a boon for art-enthusiasts in Bangalore. There have been cultural events galore in its green campus as well as exhibitions of the works of big names in the contemporary Indian art scene. In mid-2012, the gallery held a mammoth exhibition of the paintings and installations of Ram Kinkar Baij and in mid-2013 the paintings of Rabindranath Tagore were on show. This year the focus is on Amrita Sher-Gil to commemorate her on her birth centenary. This first of its kind exhibition called ‘The Passionate Quest’ featuring the works of the elusive and mercurial artist which started on 30 March has drawn a great response. The paintings have travelled all the way from NGMA, Delhi and the show is curated by Yashodara Dalmia, biographer of the artist. 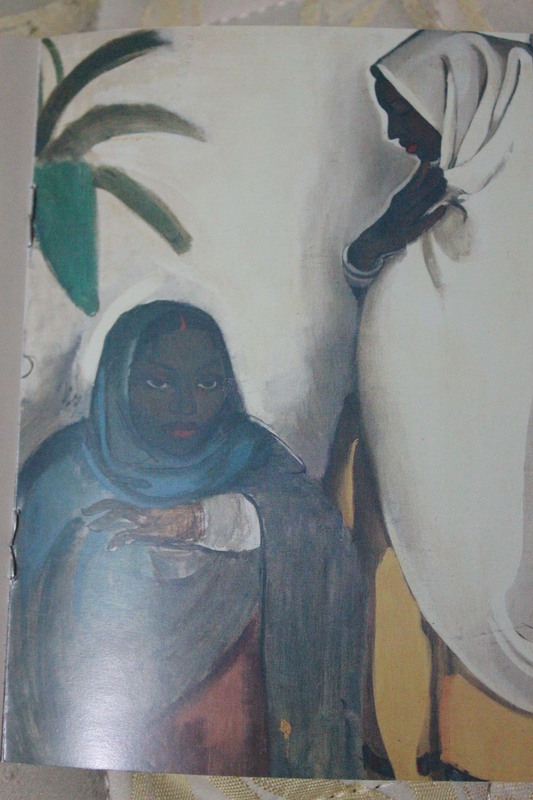 Interestingly, NGMA, Delhi in a large way came into being because of Amrita Sher-Gil. 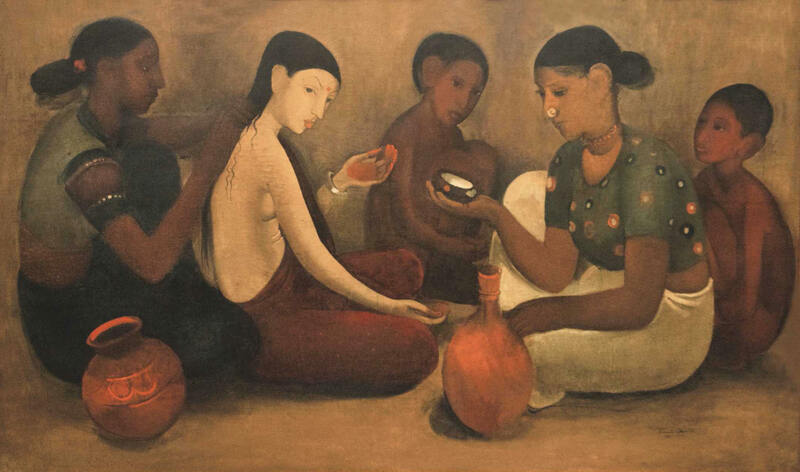 After Amrita-Sher Gil’s sudden and premature death in 1941, her family donated her large body of paintings to a trust. Upkeep of so many paintings was not easy. Many years later, when art aficionados approached the then Indian Prime Minister Pandit Jawaharlal Nehru, he suggested the idea of starting a gallery to house these paintings. The idea bore fruition when the NGMA opened in the capital in 1954. In addition to all the works of Amrita Sher-Gil, the gallery is adorned by works of other prominent artists of the country. Amrita Sher-Gil sadly lived a very short life. The eldest daughter of Umrao Singh Sher-Gil Majithia and his Hungarian wife Marie Antoinette Gottesmann-Erdobaktay, Amrita was only 28 when she died in Lahore in 1941 owing to (which many say) an abortion gone wrong. She was married to her maternal cousin Victor Egan. flaunting a wholesome smile is very impressive. Besides Hungarian Manifestation and Threshold, the exhibition also has paintings falling under two more categories – The Icon and Iconoclastic and Indian Journey. I must say the Indian Journey was my favourite. The paintings here are easily the artist’s best. 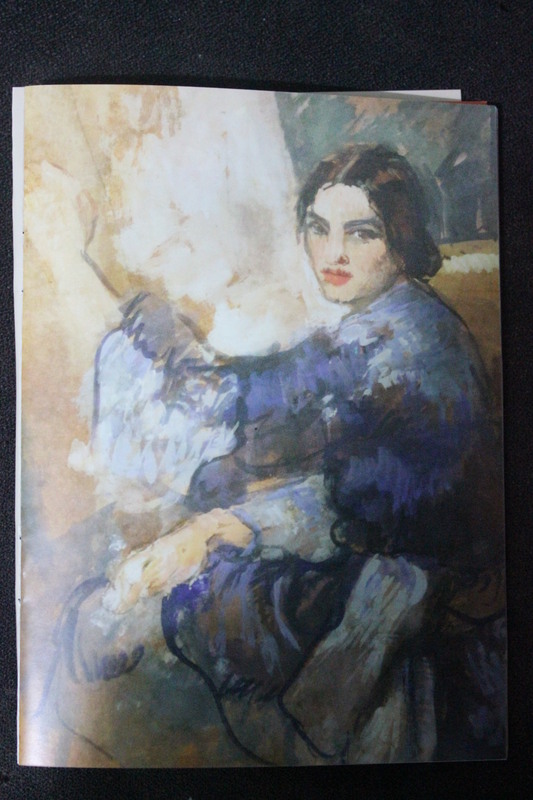 According to those closely associated with her works, “Her artistic vision was shaped by many factors – her childhood experiences, her experience of India, its landscapes and people, her inspiration drawn from other artists and art forms”. Brahmacharis. 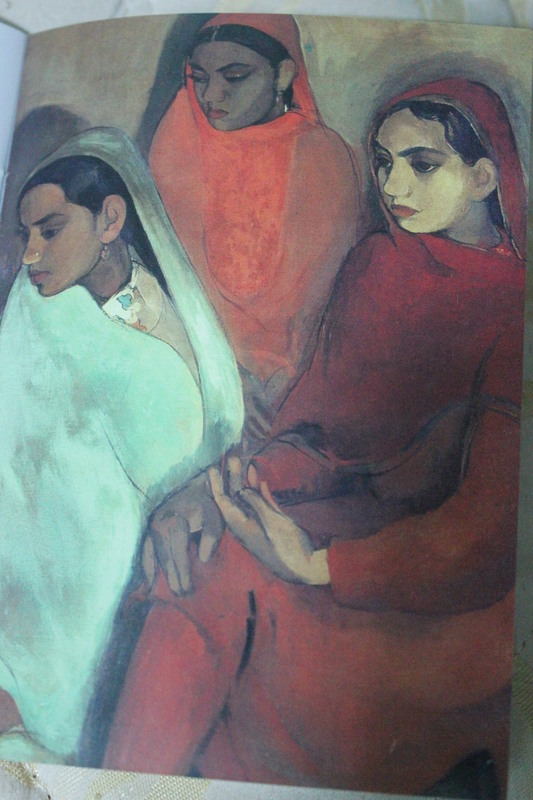 one of Amrita Sher-Gil’s finest paintings was done in 1937 during a visit to South India. 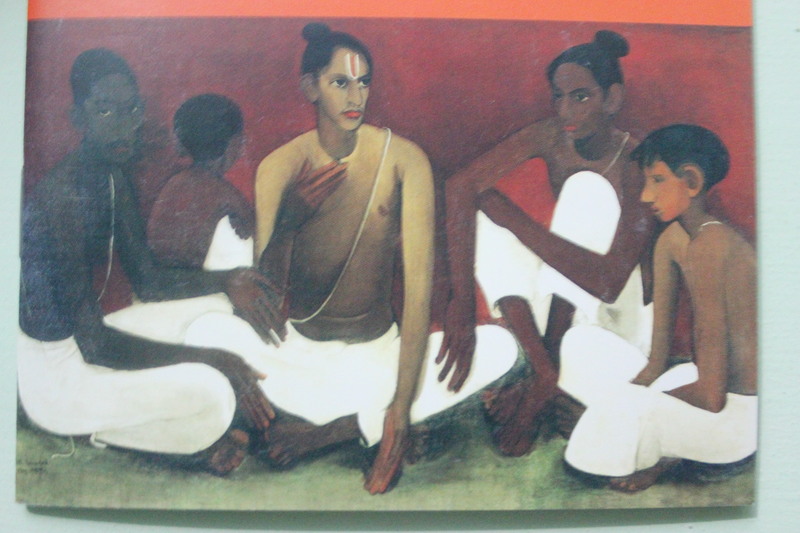 South Indian themes were a favourite with the artist. Karl Khandalwala who was one of Amrita Sher-Gil’s close associates said in 1938, “After having spent her early childhood in Hungary she developed a strong liking for India’s natural beauty and a fondness for its majestic appeal”. 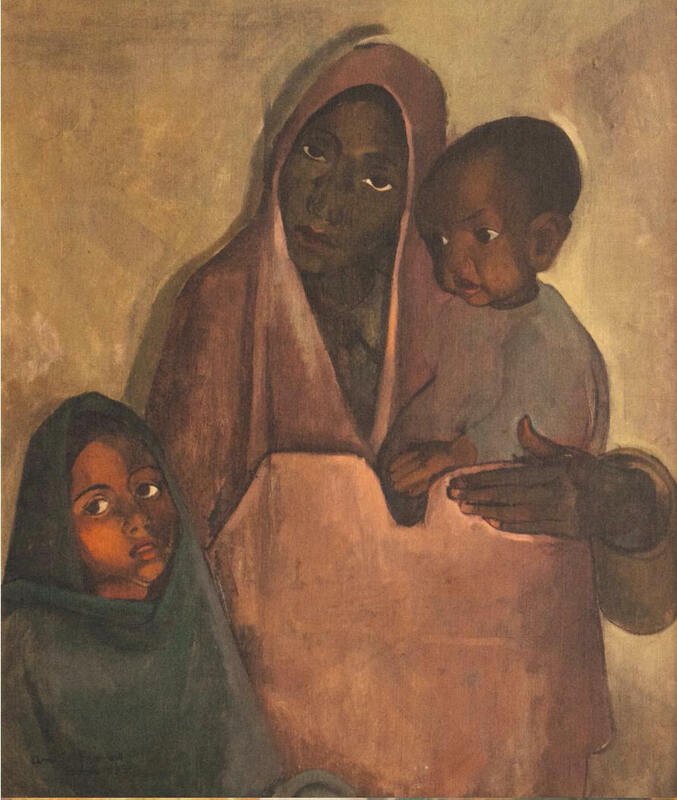 In spite of family opposition, Amrita Sher-Gil returned to India to carry on her artistic pursuits. She said, “I don’t think I shall paint at all in Europe. I can only paint in India. Elsewhere I am not natural, I have no self-confidence. Europe belongs to Picasso, Mattise, Braque and many others. India belongs to me”. 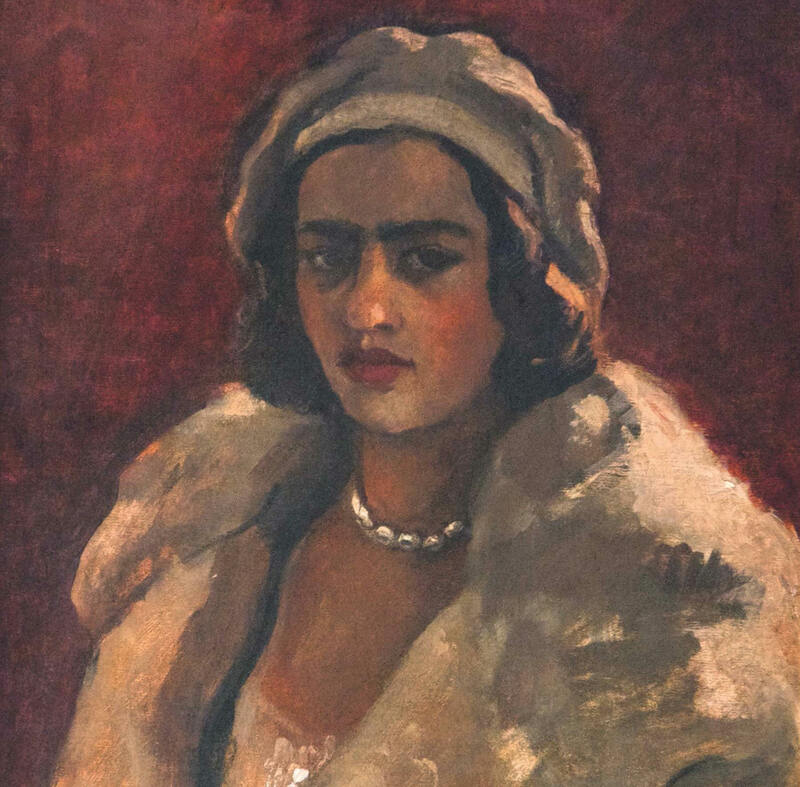 So great was Amrita Sher-Gil’s love for India, that she decided to wear only Indian clothes from 1935. 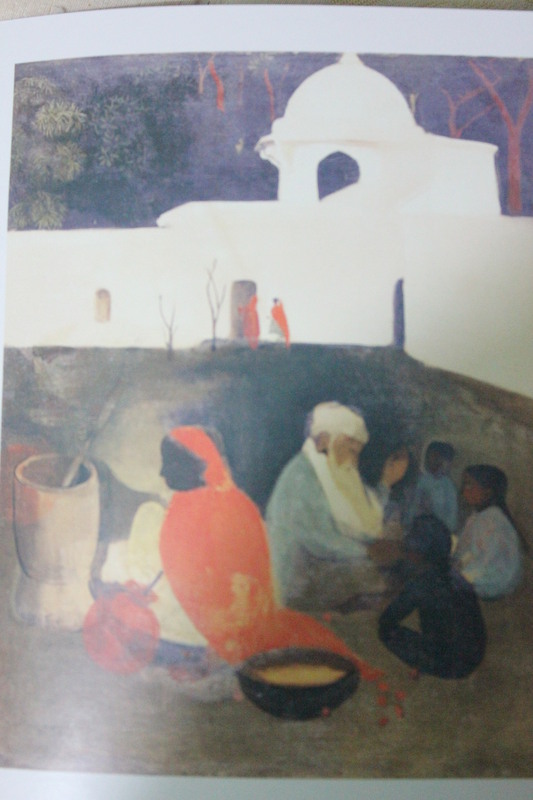 Ancient Story Teller, a 1940 oil painting. The exhibition also features the last unfinished painting of Amrita Sher-Gil. It is very tragic that someone so talented died so young. Do visit the National Gallery of Modern Art, Bangalore to have a look at the amazing paintings of Amrita Sher-Gil. The exhibition is on till 7 May.